The EFMR Monitoring Group is installing continuous radiation monitors at several locations around the Three Mile Island nuclear power station. The monitors are connected by telephone to a central computer, which downloads the data and displays it. The monitors can be set to record data at preset intervals varying from minutes to hours and can store 1500 data points. The data is downloaded via a dedicated telephone line at preset polling intervals. If the radiation level exceeds a preset alarm level the data is automatically downloaded to the central computer and a polling of all stations is initiated. The software allows the data to be displayed as tables, graphs or readings on a diagram or map. 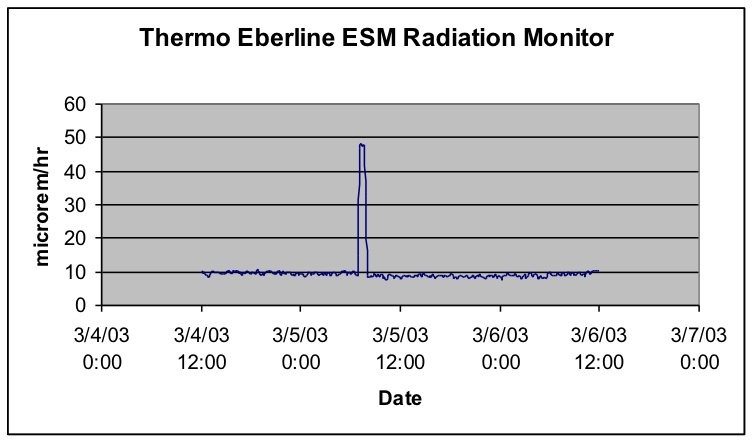 The monitoring station consists of a Thermo Eberline ESM Model FHZ 621 G-L4 wide range detector in a weatherproof housing. The housing also contains an uninterruptible power supply (UPS) and DC power supply, which operates the detector, the RS232 interface adapter, and a telephone modem. The battery in the UPS will operate the monitor and modem for several hours after loss of AC power. The detector is capable of measuring dose equivalent rates from background to 10 rem/hour. The detector also has a feature that uses the difference in radiation energy between natural background radiation and reactor fission product radiation to determine whether small radiation increases are from natural or man-made sources. The chart below shows data from one of the monitors during a 48-hour test. The peak is from a 137Cs calibration source. Five monitoring stations have been purchased and the electrical and telephone installations have been completed for 3 stations as of 27 Mar 03. The other two stations are being used for testing and will be installed when the computer programming and testing is complete.